Career Fair Award to Lyons Student! DCS presented an award last week to Sydney DeNeef of Lyons Middle School for her great responses to our questionaire. Sydney took the time at a recent career fair to answer some questions about business at our booth, and earned herself an Arduino project kit, which was presented by DCS of New York CEO, Jacob Weed. Sydney's mother, Rebecca DeNeef, a teacher at Lyons High School, was also there when the award was presented. Good job, Sydney! 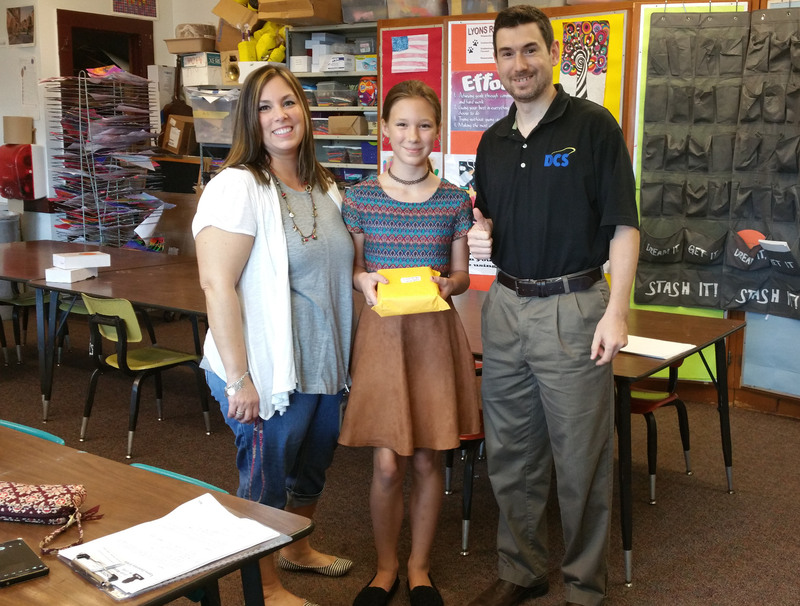 Left to Right: Rebecca DeNeef, Sydney DeNeef with award, Jacob Weed of DCS shown in the classroom of Alicia Linzy, teacher at Lyons Elementary School.